I had severe sinus pain for about five days. The sinus headache was so bad it made me sick to my stomach. I was using the neti pot two or three times daily and also Flonase and ibuprofen. Nothing helped to relieve the pain and pressure. Finally last night I decided to try something different. I cleaned out a saline nasal spray dispenser and filled it with Silver Hydrosol, then sprayed some into each nostril, making sure to breathe it up into my nasal passages. I did this twice before bedtime, and I woke up this morning well-rested and pain free! This stuff works. The pressure and pain are GONE. I'm so excited to have found something that is natural and actually works for me! Thanks for sharing your testimonial! It give me a new idea to try too! 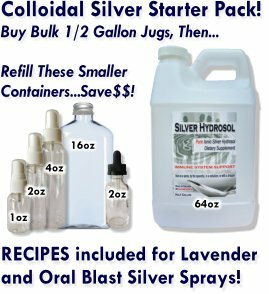 Often at night I have a bit of a stuffy nose for seemingly no reason, so I'm going to try this idea of using colloidal silver hydrosol and see what happens. Best wishes to you always and thanks for being a customer friend!